This is the oil bar painting I have been working on. It is based on a photo that I took at Long Hill Gardens here in Beverly, MA. (My reference photo is posted here on Mar. 20.) I made an early start this morning, because the rest of the day was spoken for. I concentrated on the perspective for the post and beam of the grape arbor itself. I think it looks better. As I worked, I tried to make subtle corrections in the position of those grapes because I would to be able to capture the beautiful way the grapes fall over the arbor. I continued to work on this oil bar painting today. I am painting this grape arbor, working from a photo that I took at Long Hill Gardens, here in Beverly, MA. Today I started with adding more pale blue (sky) in the lower right part of the canvas. I also mixed up some lighter green, starting to differentiate the leaves. As I worked, I tried to define where the branches are and corral the grapes that are out of place. It was almost time to stop when I tackled the shape of the arbor itself. I used red to try to see the perspective more clearly. The perspective is still yet not correct--but I hope to fix that tomorrow, and then I will correct the color. This morning, I did some more work on this oil bar painting. I am working from a photo of a grape arbor, a picture that I took at Long Hill Gardens here in Beverly, MA. (My reference photo is posted here, Mar. 20.) This morning I reworked green leaves, dark stems on the upper left part of the canvas, and the shape of the grape arbor structure. As I worked, I made a lot of small changes, and a lot more changes to go. This is an oil bar painting that I have been working on, based on a photo of a grape arbor, taken at Long Hill Gardens in Beverly, MA. (The reference photo is posted here on Mar. 20, 2014.) Over the past few days, I have revised the composition by changing the placement of the grapes. I like the result, but I needed to clean up the color. I didn't have much time to work on this today, so I just concentrated on cleaning up the pale blue color of the sky, peeking through the leaves. This was a modest goal for the day, but I think it made a difference. Here is my oil bar painting as it looked when I was finished for the day. I am working from a picture that I took at Long Hill Gardens; my reference photo is posted here on Mar. 20. Yesterday I reworked the placement of the grapes. In the process, I reduced the number of grapes and lost some of the color. 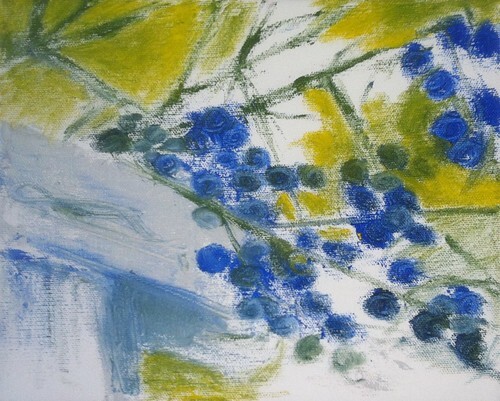 Today I put in more grapes (following my revised plan for the composition) and restored some of the deep blues that had faded in the process. 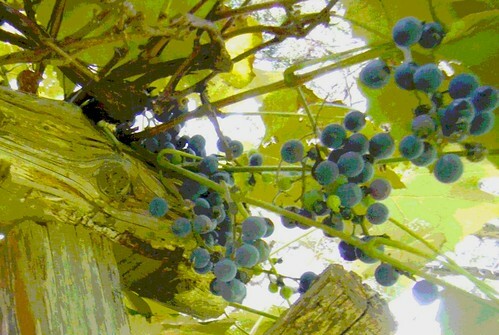 I also added some light blue reflections to the grapes, and worked a little bit on the wood beam of the arbor. Now I feel like this is back on track. I worked on this painting again this morning. This is based on a photo that I took at Long Hill Gardens, here in Beverly, MA. (My reference photo is posted here on Mar. 20.) Today I reworked the placement of the grape clusters, trying to come closer to the shapes in the reference photo. First I outlined the shapes on a printed copy of the reference photo. 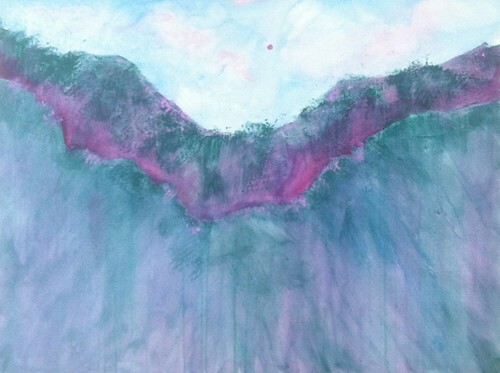 Then I outlined the same shapes on the canvas, using a bit of red-violet paint. That was scary, but I needed the color contrast to see where I was. I corrected the placement of some of the key grapes, and eliminated some others that were in the wrong place. Then I painted out the red lines, replacing them with green and blue background. (Now there aren't as many grapes as there should be, but I will be putting them back in, as well as reworking the color.) I also added some color to the wooden structure of the arbor. This is as far as I got today. Still lots to do. This is an oil bar painting that I have been working on. It is based on a photo that I took at Long Hill Gardens, here in Beverly, MA. (My reference photo is posted here on March 20, 2014.) Today I used some light blue to define the negative spaces of the sky through the trees. 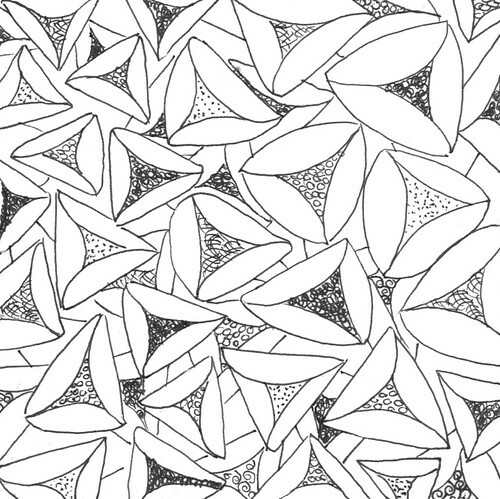 As I worked, I made some corrections in the shapes of the leaves and the placement of the grapes. 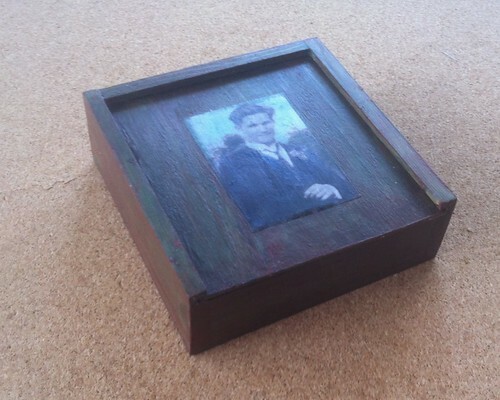 "Dad with Boutonniere" Keepsake Box, a photo by randubnick on Flickr. This is the project I finished yesterday, a wooden keepsake box. The image on the top of the box is a picture of my father as a young man. The original photo was a group shot in black and white. I used some digital sleight-of-hand to crop my father's picture out of the group and create an individual portrait, and then added color and texture. I collaged the image to the box, rubbing to get some of the wood grain to show through. Then I painted the box, trying to get a look that goes with the image. I spent a lot of time of details that don't really show: making sure the lid didn't warp, and smoothing the edges of the box top because the lid has to slide in grooves when the box is opened and closed. 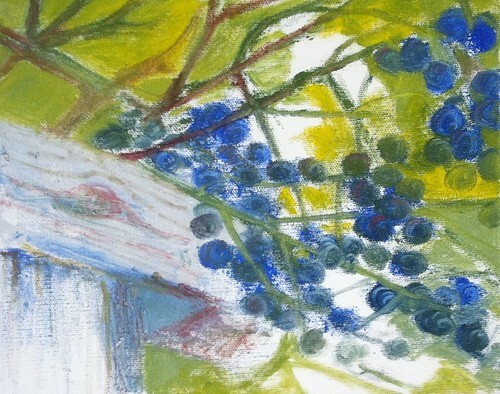 Grape Arbor (Oil Bar Painting as of Mar. 23, 2014), a photo by randubnick on Flickr. This is an oil bar painting, in progress. I am working from a photo that I took a few years ago, a picture of a grape arbor at Long Hill Gardens, here in Beverly, MA. (My reference photo is posted here on March 20, 2014.) Today I continued to work out placement and composition. I worked out some of the complications of the tangled vines. I am adding color when I need help seeing where things go, so some of these colors may change. I was surprised to find myself reaching for the alizarin crimson, but I could see it in the photograph. 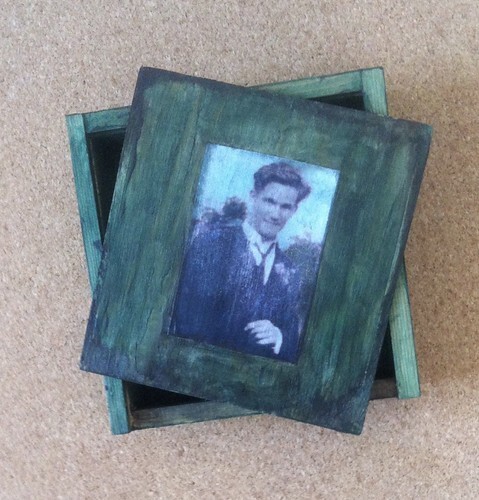 To be continued. . . .
Dad with Boutonniere Keepsake Box as of Mar. 21, 2014, a photo by randubnick on Flickr. Here's the keepsake box I have been working on. 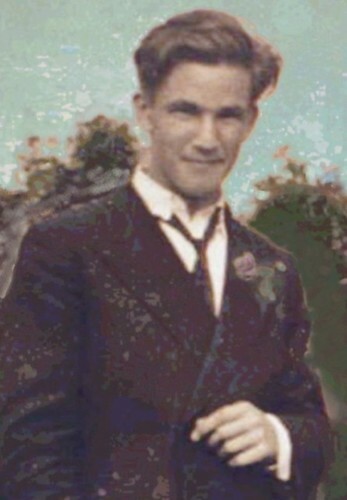 The image is a digitally modified photo of my father as a young man. (I created an individual picture from a group shot, and added the colors and textures.) Yesterday I added another coat of paint, and worked on smoothing the edges so the lid will slide into place easily. There are just a few tiny details to fix, but this is basically what the box will look like. Grape Arbor (Oil Bar Painting as of Mar. 21, 2014), a photo by randubnick on Flickr. Today I got started on this painting of a grape arbor. This is oil bar on an 8 x 10 inch canvas and a photo that I took at Long Hill Gardens as a reference (posted here yesterday). All I had time to do today was rough out the basic composition. But it felt good to begin. Grape Arbor (Posterized) Reference Photo for Painting, a photo by randubnick on Flickr. I am getting ready to start a new painting, another oil bar painting of branches. Today I finally looked through my photographs, looking for ideas. I found some nice photos of grapes on the arbor at Long Hill Garden, here in Beverly, MA, originally posted here on September 16, 2010, (and the posterized version on September 20, 2010). This morning, I created my reference photo for painting. I cropped the posterized version to get the composition I wanted, and also modified the exposure and contrast to make things easier to see. Then I printed out 8 x 10 inch copies, the same size as the canvas I plan to use. So now I am ready to go. 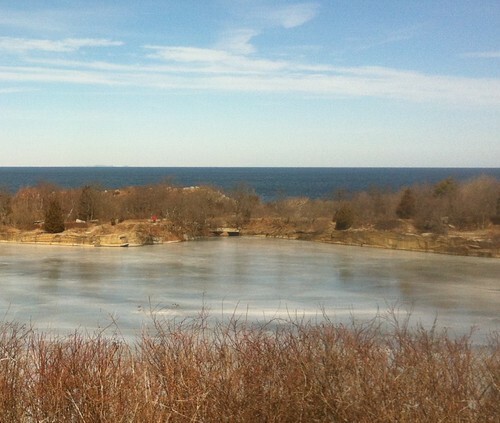 Quarry, Ice, and Ocean, a photo by randubnick on Flickr. Here is one more image from Monday's stop at Halibut Point in Rockport, MA. Today I took this close-up image out of one of my photos, and used iPhoto to get this composition. I like the horizontal bandsin this picture: grasses, ice in the quarry, rocky edge enclosing the quarry, and then the dark blue ocean. Path to Halibut Point, a photo by randubnick on Flickr. Here's another photograph from yesterday's adventure. This is the path to Halibut Point State Park, in Rockport, Massachusetts. Yesterday was sunny, but so cold that I couldn't keep my gloves off for very long to take pictures. But I did take a few. 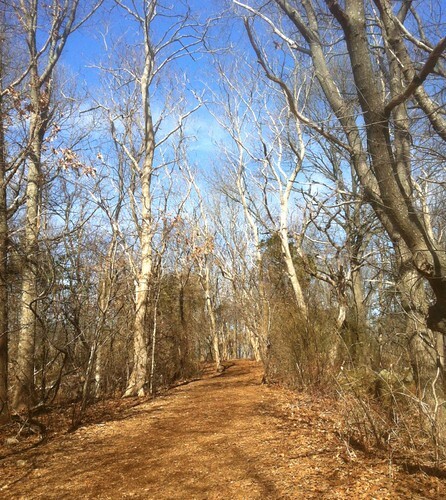 I liked the trees bordering the path, so I took this photo. Tonight I used iPhoto to adjust the exposure and to crop the original image to get this composition. 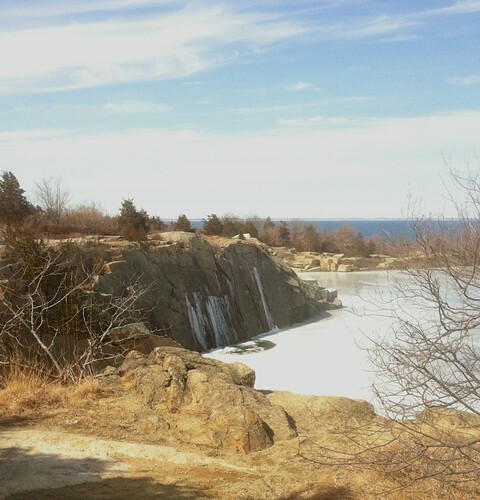 Quarry at Halibut Point, a photo by randubnick on Flickr. Today I took my cousin for a ride up to Halibut Point State Park in Rockport, Massachusetts. It was very cold, but we walked around a bit and took some pictures, mostly of the quarry. The water running down the rocks has turned to ice, and so has the water in the quarry, but you can see the blue water in the ocean behind it. This photo one of the best one that I took today. Tonight I used iPhoto to adjust the exposure, to straighten the image, and to crop the image to get this composition. Pattern from Reflections, a photo by randubnick on Flickr. 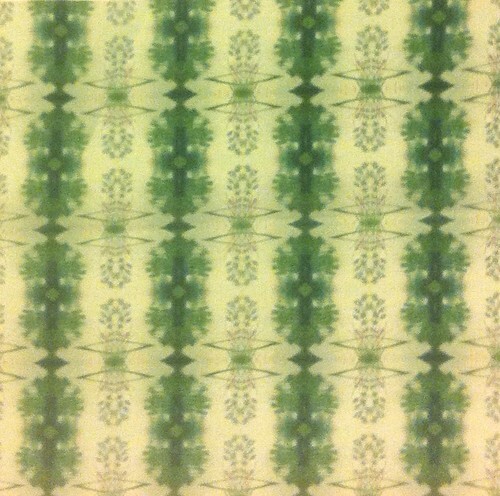 This is a small piece of fabric printed with a pattern created from one of my oil bar paintings. Last summer, I did an oil bar painting of called Reflections, a landscape of trees and reflections of trees at Bradley Palmer State Park. (You can see the finished painting posted here on September 7, 2013.) The next day, September 8, I published a close-up photo showing some details of the photo. At the time, my cousin said she thought it would make an interesting pattern, and offered to have a sample made up on Spoonflower.com. I was curious so I said yes. Today my cousin came to visit and brought the swatch along. Although I had seen a small image of the pattern online, today was my first in-person look at the pattern on a piece of fabric. I liked the way it looked, so I took some pictures. Irish Landscape (Digital Woodcut), a photo by randubnick on Flickr. Maybe this is a little early for images of the Emerald Isle, but a lot of people will be celebrating St. Patrick's Day tomorrow, even though the 17th of March isn't until Monday. This image started with a photo that I took back in 2004. 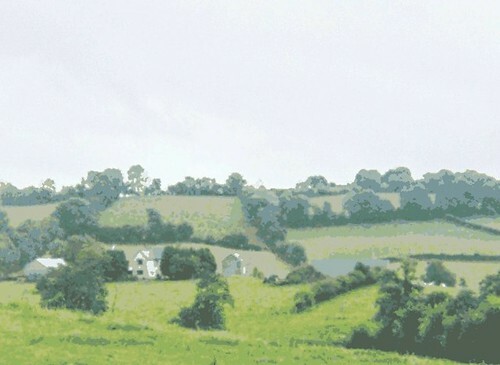 We were driving from Belfast to Galway, and I took a picture of the countryside. Tonight I cropped this image out of the original photo and used Painter to create this digital woodcut. Composition with Hamentashen (Pen and Ink Exercise), a photo by randubnick on Flickr. Here is another pen-and-ink exercise, more hamentashen (triangle-shaped filled cookie eaten during the Jewish holiday of Purim.) I started this drawing yesterday but abandoned it because there were too many mistakes. Today I went back to it and finished it up, using a dark background to fix some problems. I also did a little digital cleanup with Painter. Hamentashen (Pen and Ink Exercise), a photo by randubnick on Flickr. I wanted to do was something easy tonight. This is what I did, but it wasn't so easy. 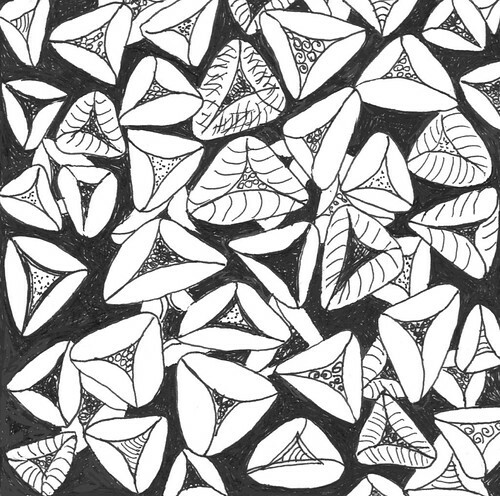 This little pen and ink exercise is done on an "artist's square" of about 4 inches. I was thinking about hamentashen (triangular filled cookies eaten at the Jewish holiday of Purim which is coming right up.) So I started drawing triangular shapes. Then I decided to fill the cookies with different textures. I scanned the drawing into the computer, but I had to do a little digital cleanup with Painter. Dad with Boutonniere Keepsake Box as of Mar. 12, 2014, a photo by randubnick on Flickr. Here is the keepsake box I have been working on. The image is a picture of my dad as a young man. I used Painter to create an individual portrait in color from a black and white group photo. I printed out a copy and collaged it onto this box. Today I put another coat of paint on the box and it looks better already. I added a little transparent blue paint to darken the suit. And I spent some time filing away at edges because the top slides into grooves in the wood, and I want to make sure the box will open and close easily. I have been trying to decide whether or not to add some decorative elements, but I haven't yet made up my mind. 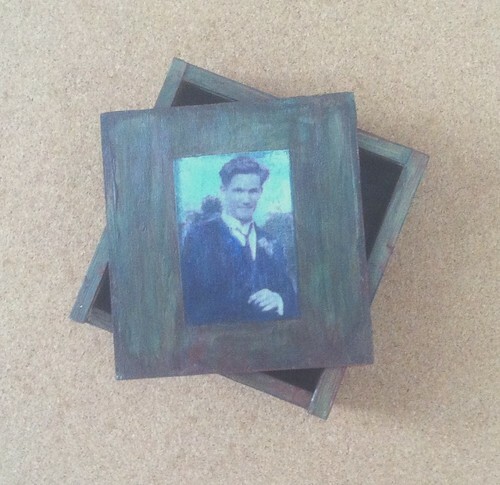 Dad with Boutonniere Keepsake Box as of Mar. 11, 2014, a photo by randubnick on Flickr. This is a work-in-progress. Today I started another project. 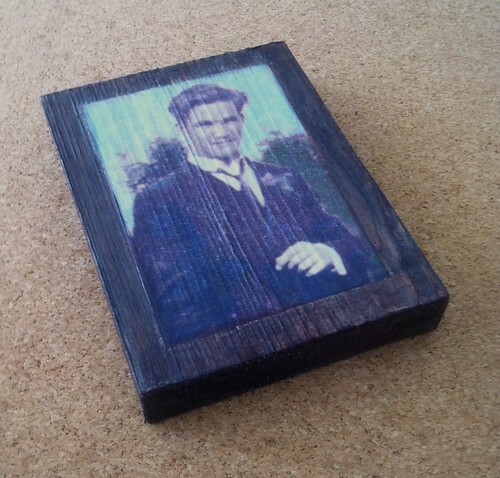 As with yesterday's post of a photo collage on wood, I used an image of my dad with a boutonniere, an individual photo of him that I created from a group photo -- but this time I used the revised version (posted here March 5). 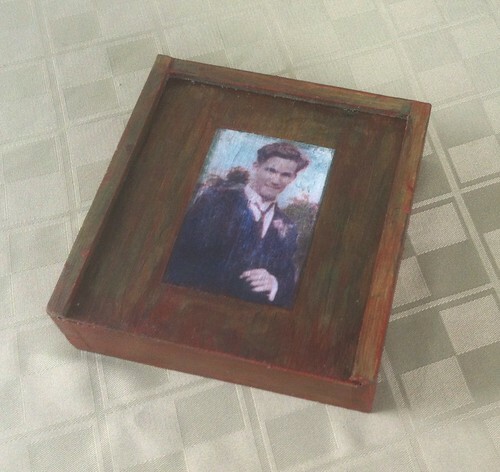 I decided to collage the image to a wooden box, and then paint it. This is the first coat; this is not the final color. Dad with Boutonniere (Photo Collage on Wood), a photo by randubnick on Flickr. Yesterday I collaged this image onto wood. This is a digitally modified photo of my dad, posted here on August 28, 2014. I used some digital slight-of-hand in Painter to create this individual portrait from a very small image of my father in a group photo. I like the way this image looks with the wood grain showing through and was very happy with the result -- even though I had forgotten to use the revised version of the image, posted here on March 5, 2014. Purple and Pink Necklace with Golden Bells, a photo by randubnick on Flickr. Here is another necklace that I made yesterday, with rose quarts, purple beads, and gold metallic bells strung on a cotton cord. I made this as a gift for a friend who hosted us during a trip to England several years ago. This necklace is on its way to her now, and will be hand delivered in a few days. In was interesting to design a piece of jewelry with a specific person in mind. I hope she will like it. Pendant with Wood and Incised Jade, a photo by randubnick on Flickr. 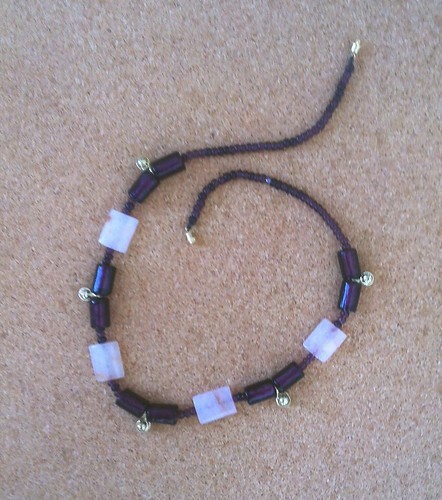 This is the first of two necklaces that I made today. 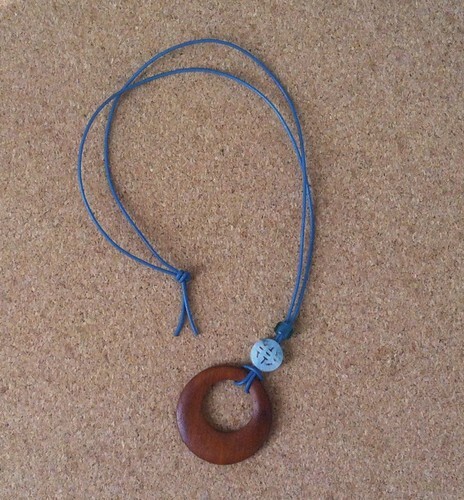 This is a wooden circle with incised jade and a glass bead on a blue cord. Plum Nuts (Necklace with Wooden and Glass Beads), a photo by randubnick on Flickr. Yesterday I finished my "Plum Nuts" necklace, and this project really was driving me crazy. I almost took the whole thing apart. But I finally got it to come together. I made some adjustments in the pattern and decided to add some teal green glass beads. I like wearing plum with teal and brown, so this works for me. 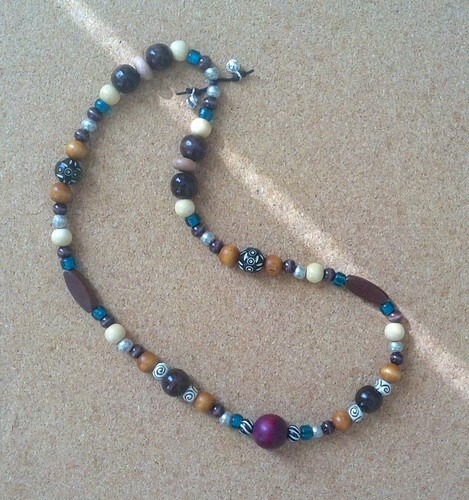 This is made with wooden beads accented with incised beads, silver beads, and glass strung on a cotton cord. I finished it with knots and two little silver bells. Plum Nuts (Necklace in Progress as of Mar. 5, 2014), a photo by randubnick on Flickr. This is a necklace I started yesterday. 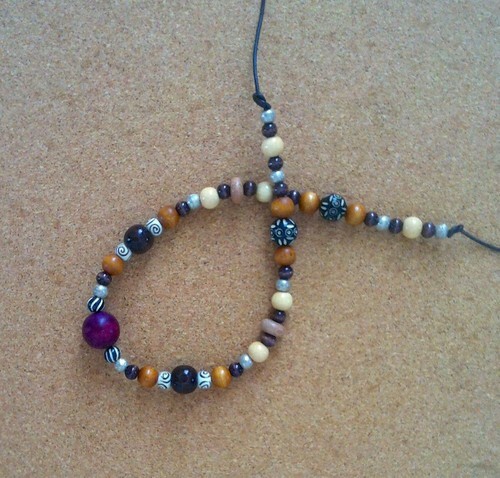 I began with a large plum-colored dyed wooden bead, then started added some incised beads for texture, some silver beads for shine, and some wooden beads in various shapes and colors. I reworked the patterns and sequences of beads several times to come up with pleasing combinations. I worked on this necklace for longer that I planned to but it was still not finished, so I tied it off and took this photo. To be continued. . . .
Dad with Boutonniere (Digitally Modified Photo) Revised, a photo by randubnick on Flickr. This is a revision of an image that I posted here back on August 28, 2014. This picture of my dad as a young man really started with a group shot of my father with several other guys. The version I had was very small and marred with scratches, so I had to resize it and clean it up.Then I used Painter to resize the image, and used cut-and-paste, digital pastel, and color overlays to create an individual portrait. I posterized the image to create the textures. All this created a picture of my dad that is one of my favorites, but I wasn't happy with the composition because I didn't like the placement of the trees in the background. I wanted the foliage on the left to extend all the way to the border, so today I opened the image in Painter again, and use more cut and paste as well as digital pastel to create more trees in the background. I am glad I went to the trouble to do that because now I like the image even better. 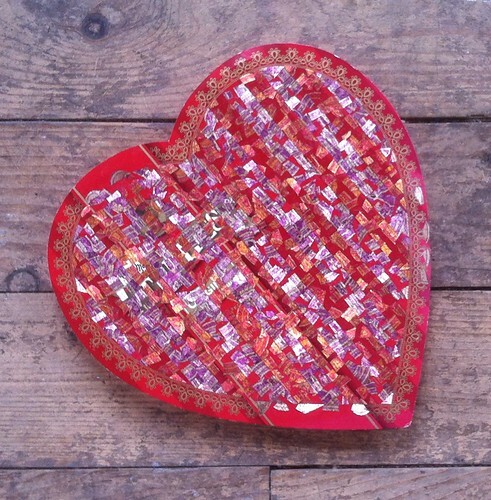 Another Heart Shaped Box as of March 4, 2014, a photo by randubnick on Flickr. Evergreen (Acrylic Water Media Painting), a photo by randubnick on Flickr. I worked on this mountain landscape today. First I took care of some minor corrections. Then I added more transparent pink to the sky, and more green texture as well as a blue and green washes to the lower part of the painting. I also added a little bit of pale yellow in a couple of places, just to balance the color. I think this is finished now. Evergreen (Acrylic Water Media as of Mar. 2, 2014), a photo by randubnick on Flickr. Here is the painting I have been working on. This mountain landscape is painted from my imagination, but is inspired by memories of my home state of Colorado. I am using acrylic paint with water on watercolor paper. The painting looks quite different today. This morning, I decided to that I wanted to see a second line in the painting, so I added another mountain range to the painting, following the shapes already apparent in the painting. 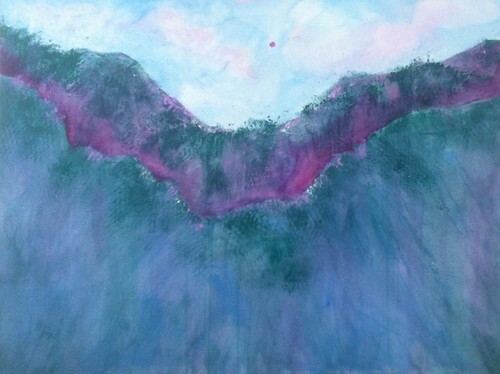 Then I added stronger color and a bit more texture, and even added a little bit of pink to the sky. There are still a few things that I want to fix, so this is still a work in progress. Evergreen (Acrylic Water Media as of Mar. 1, 2014), a photo by randubnick on Flickr. This morning I worked a little bit on this painting. 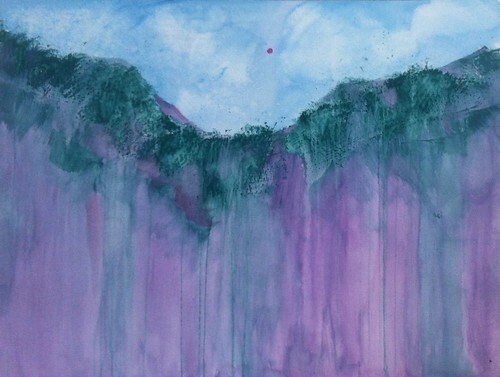 This is one of my mountain landscapes, painted with acrylic used as water media on paper. Today I added some transparent green and purple washes to make the lower part of the painting darker. And I painted into the green textured areas with purple, trying to define some of the shapes. I like the idea of suggesting some areas above the tree line. This is still a work in progress. I hope to do more tomorrow.